 Where is the closest public transportation?  Is there accessible parking? Where is it in relation to the entrance?  Is the entrance wheelchair accessible? Does it have an automatic door opener?  Are all doorways in the facility wide enough to go through with a wheelchair?  Are the locker rooms, restrooms and shower area accessible? 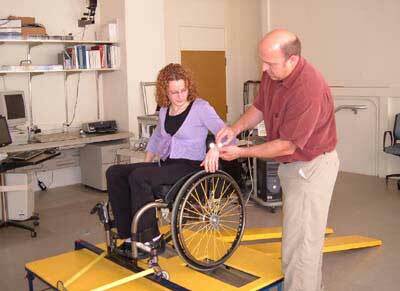  Are the spaces around the equipment wide enough to fit a wheelchair?  Are there elevators between floors?  Do they have the specific features you are looking for (such as a pool lift, hand cycle-type ergometer or other equipment, yoga classes, etc.)?  What are the fitness trainers’ qualifications? Do they have training or experience working with people with disabilities? This article was adapted with permission from “Using A Fitness Center Does Not Have to be an Exercise in Frustration: Tips for People With Mobility and Visual Disabilities” (2008) by June Kailes, Associate Director, Center for Disability Issues and the Health Profession (CDIHP). Download the original document at http://www.cdihp.org/fitness%20center%20nov08.pdf or contact CDIHP, Western University of Health Sciences, 309 E. Second Street, Pomona, CA 91766-1854; 909-469-5380; ahcs@westernu.edu. You know you should be more active. You would like to find a usable fitness center or health club, but it seems like an overwhelming task. On the other hand, isn’t your health worth the hassle? • Like other public places, fitness centers must comply with the Americans with Disabilities Act (ADA), which requires them to provide equal access for people with disabilities, including accessible parking, entrances, restrooms, paths of travel, signage, etc. 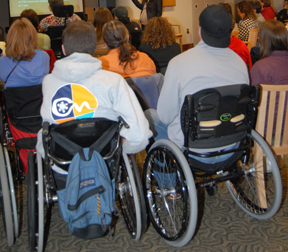 • Fitness centers cannot deny services or membership to people with disabilities. Neither can they require anything from you that they do not require of all members, such as a doctor’s permission to be there. • You have a right to ask fitness centers to remove barriers and make changes to improve accessibility. The ADA law can only be enforced if you bring accessibility problems to the attention of the fitness center’s staff and owners. Often they are not aware that barriers exist or they may not think there is a problem because no one has ever told them. • Call ahead to ask about accessibility (see "Fitness Center Accessibility Checklist,” right). If it sounds promising, request a tour of the facility. • While touring a facility, see if there are any barriers that will make it harder or impossible for you to do the exercises you want to do. If you see problems, tell the person who is taking you around and see if they have solutions already. • What does membership cost? If it is too expensive, ask about scholarships, sliding-scale options or other financial assistance. YMCAs or public community fitness centers are more likely to have these policies. • Ask whether the facility will allow you to bring a companion to assist you at no cost. • Ask for a guest pass for a small daily fee or no cost so you can try out the facility a few times. • When you first visit a facility, discuss any barriers you find with the staff person showing you around. If you want to request a change, make sure you address it to the appropriate staff person. While simple changes might be handled by center staff, larger changes may require that you talk to the manager or owner. Ask about the best way to contact that person. • Be familiar with what the ADA requires, or know where to find more information (see “Accessible Fitness Centers: Resources,” below). • Know your resources, including where to find information on accessible equipment (see “Equipment & Products"). Be prepared to make recommendations, and have this information ready to share with the facility’s staff. • Suggest simple, low-cost solutions as well as bigger, high-cost solutions. For example, asking a staff member to assist you with transferring to a piece of equipment is cheaper than buying a machine with removable seats to accommodate a wheelchair. You will need to teach the staff about your abilities and limitations and work together with them to meet your needs. • Be willing to file a complaint. If your request comes under the ADA requirements, you may file a formal, legal complaint with the United States Department of Justice (http://www.ada.gov/; 800-514-0301). It pays to speak up and get fitness centers to recognize the accessibility barriers that exist in their facilities. When you speak up you create demand for change. Using A Fitness Center Does Not Have to be an Exercise in Frustration: Tips for People With Mobility and Visual Disabilities, Center for Disability Issues and the Health Profession. A guide to explaining consumers' rights and how to work with a fitness facility to improve accessibility, http://www.cdihp.org/fitness%20center%20nov08.pdf. Call 909-469-5380 or email ahcs@westernu.edu to request a copy. 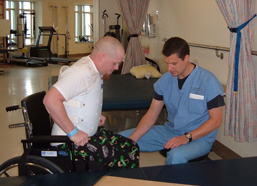 Removing Barriers to Health Clubs and Fitness Facilities: A Guide for Accommodating All Members, Including People with Disabilities and Older Adults , North Carolina Office on Disability and Health (2008). Go to www.fpg.unc.edu/~ncodh/pdfs/rbfitness.pdf or call 919.966.0857 to request a copy. Access Equals Opportunity: Recreation Facilities & Fitness Centers, King County Office of Civil Rights (2008), explains the laws regarding accessibility of fitness centers to individuals with disabilities.Go to http://your.kingcounty.gov/dias/ocre/fun.htm, or call 206-296-7592 to request a copy. For questions about the ADA or to contact your local ADA Information Center, call the National Network of ADA Centers at 800-949-4232 or visit http://www.dbtac.vcu.edu.